I love granola, but, as the mom of a kid with nut allergies, most packaged brands are off-limits. This is an easy recipe which, even if your household is allergy-free, is a much cheaper, healthier option than most of what you can find in your supermarket’s cereal aisle. Note: Some people who are allergic to tree nuts also cannot have coconut, in this case you can easily substitute canola or other mild vegetable oil. Likewise, any seeds which pose an allergy risk can also be omitted. If you are cooking for someone with a severe allergy, check packages to make sure that the oats, seeds and dried fruit you have purchased have not been packaged on a line with nuts. 1. Preheat oven to 325 degrees F. Line a cookie sheet with foil and spray with nonstick cooking spray. 2. 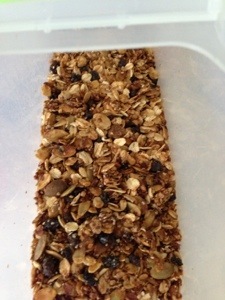 Mix together oats and seeds. 3. Combine oil, honey, sugar, salt and vanilla extract. Pour over oat and seed mixture and mix well. 4. Spread onto cookie sheet–patting it down evenly. 5. Bake for 30 minutes, stirring 2 or 3 times to make sure it doesn’t burn. 6. Cool on tray and mix in optional fruit. 7. Store in a tightly closed container. This entry was posted in A Peek Into My Kitchen, Allergies, Food and Drink, Food related and tagged #meatlessmonday, breakfast, healthy, meatless monday by jessica. Bookmark the permalink.